Shifter Jack Talent has been through hell and has come out broken. The only way he knows how to live is to destroy the demons who tortured him. But his actions haven’t gone unnoticed. The Society for the Suppression of Supernaturals — for whom Jack is a regulator — is determined to uncover who has been killing the demons and they’ve assigned Jack to the case. This wouldn’t be a problem, except they’ve given him a partner…and she’s the last woman on earth he would ever want to be paired with. Mary Chase is his biggest rival in the SOS, but Jack will never let her know that his disdain for her is a lie. The beautiful GIM has captivated him from the moment they met, but should Mary uncover his secrets, she’ll hate him forever. But the longer he’s around Mary, the harder it is for Jack to maintain his distance. And when their case takes an unexpected turn, Jack will have to face his past and a dangerous new enemy or it’ll be Mary who pays the price. Shadowdance will leave you breathless! Kristen Callihan’s fourth Darkest London novel is a dark, sensual thrill ride that is sure to captivate readers from the very first page. Jack has come a long way from the charming shifter he once was. His imprisonment and torture in the last book, Winterblaze, has forever changed him. Jack is tormented by his memories and scarred by what was done to him. My heart broke for him and those who love him the most, particularly Ian, the man who is Jack’s father in all ways but biological. The deeper I delved into Shadowdance, the more I wanted to see the caring, loyal shifter find his way back home. Mary is the catalyst for his recovery. She’s got scars of her own and hides her pain well, but there’s a vulnerability to her which made me desperate to see her happy. Despite everything she’s been through (or perhaps because of it), Mary possesses a core of inner strength you have to admire. Combine said strength with her intelligence and spirit and there’s no question as to why I think Mary’s a phenomenal heroine. As individuals, Mary and Jack are undeniably appealing. Put them together and the sparks practically fly off the page. The two of them have incredible chemistry and their relationship is filled with witty banter, unexpected heartbreak, sizzling heat, and sigh-worthy romantic moments. Ms. Callihan hits all the right notes with these two, simple as that. 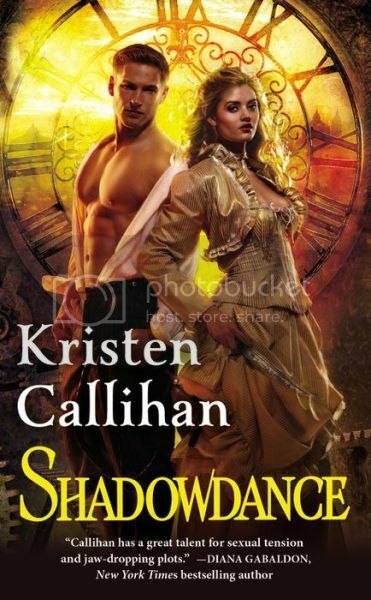 Romance and complex protagonists aside, there’s a richness to Ms. Callihan’s world building in Shadowdance that just delighted me as a reader. I never know where Ms. Callihan will take her characters or the Darkest London universe next, but I can have faith that whatever surprises she has in store will come about organically. In Shadowdance, Jack and Mary face off against new supernatural entities, plus we get to further explore beings we already know a bit about from previous books (such as the GIM). I don’t want to say too much for fear of spoiling the story, so suffice it to say that there’s never a dull moment in this book. Even if you can guess what’s coming, Ms. Callihan will still manage to knock your socks off. Shadowdance is the fourth Darkest London book and I highly recommend reading this series in order. If you haven’t read Firelight, Moonglow, and Winterblaze, you can probably still follow along well enough, but the book might not have the emotional resonance it would otherwise have. Fans of the series will undoubtedly be happy to see some of their past favorite heroes and heroines play supporting roles in Mary and Jack’s story. The only downside to Shadowdance is that I finished the book desperately wanting to read the next story, Evernight, because man, oh man, does Ms. Callihan lay some intriguing groundwork for Holly Evernight’s book. It’s impossible for me to pick a favorite Darkest London book because they’re all fantastic. Shadowdance continues Ms. Callihan’s streak of delivering imaginative, emotional reads that will dazzle old and new fans alike. I loved Shadowdance and I cannot recommend it highly enough!